Hello Friends, It’ time for a new challenge at Just Us Girls. This week we have a photo to spark your creativity! One of my very good friends is battling cancer for the second time and I needed to send him a card to let him know how much we care about him. He is the kindest and sweetest man I have ever known. It breaks my heart to see him going through such a horrific battle. I hate Cancer! It took my mom when my son was only 4 and she was far to young, and many other family members along the way for myself and my hubby. I can’t take credit for this card at all, I saw it somewhere on Pinterest and can’t find it again, or I would have linked up the original for you. All the text was done on my computer. The tags were inspired by the photo and were made with scraps of paper and SU corner punch. The little tiny hearts were inspired by the red in the photo and are the inside of a Verve trio die-cut set that I just love! I have it linked up for you Here! I outlined the tags with a black marker to make them pop. 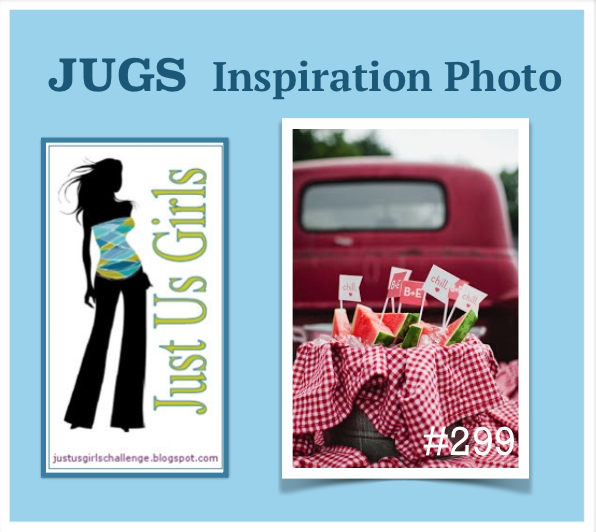 Please come on over to Just Us Girls and join us! Who knows you may be selected as our Chic of the Week and then onto being a guest designer in the future just like talented Ros Crawford. Categories: Cards | Tags: Card making, Cards, rubber stamps, stamping, Thinking of you, Verve | Permalink. What a great encouragement/ support card! What a special and speculat card Nancy. It really says it all. Hope that your friend does well. This is such a lovely card…wonderfully designed! Great card design and I love the message conveyed. I’m so sorry to hear about your friend, Nancy. Sending prayers his way. Your card is lovely and will surely lift his spirits! Great card, Nancy. 😉 I love the daily pennants with the patterned hearts. Love the banners and all of those cute little hearts! Well done, my friend! Wow, this is a perfect card and so pretty. I love the thought behind this card. Great job my friend. Have a wonderful weekend. What a beautiful card and sentiment behind it Nancy. I hope your friend pulls through his cancer battle. Oh Nancy you are too clever. 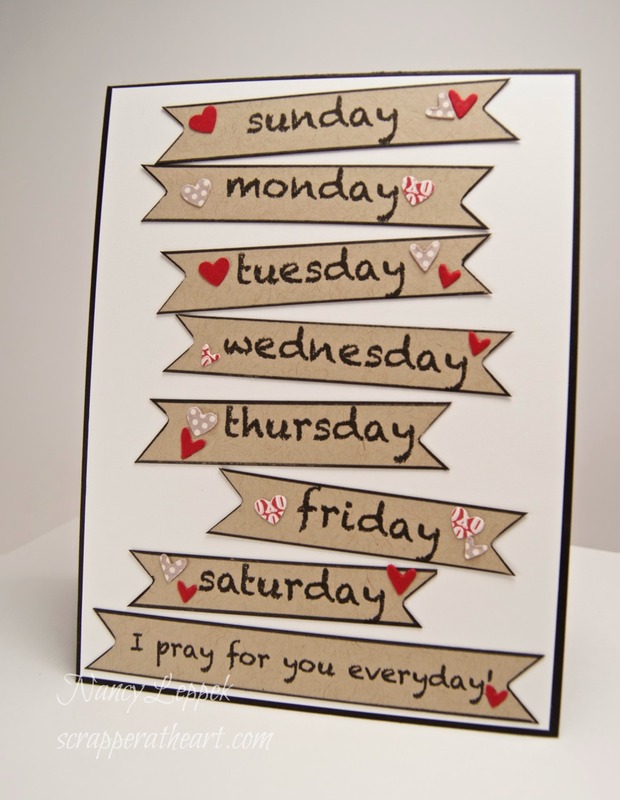 Great card and love how you have the days all crooked the sweet little hearts and the sentiment it perfect. The inked edges sure make the days pop. What a beautiful card for your friend. So sorry to hear about his illness. He will be uplifted by this, I’m sure. What a wonderful card to send to your friend, Nancy. I’m sure you’ll appreciate the card and your prayers. So sorry to hear about your friend. This is such a perfect card for him. Hope he does well. This is a wonderful card for both the inspiration photo and for your dear friend! Love the individual banners with the little hearts. This will definitely show your friend how much you care and love him.